If prizes were handed out for how you present an album then the book can be closed on the page of the Wild Ponies. Not only is the mystical music mood of Galax available in your living rooms, it can also transfix an intimate listening venue from literally anywhere in the world. Suburban Kings Heath to rural Virginia may or may not be a universe away depending on your mind-set, but the miles were gently erased during the first part of this Kitchen Garden show. Doug and Telisha Williams aka Wild Ponies are fast becoming perennial favourites on the UK touring circuit for American roots artists. Since their last visit to the West Midlands area in January, the East Nashville based duo has released a brand new album titled GALAX and are currently in the midst of comprehensively touring it across Europe and the States. The vinyl copy was perched proudly behind the Kitchen’s performing space and there could not have been a better promotional opportunity than dedicating eight songs from the record during the first set. The unanimous highlight from this segment of the show had to be Telisha’s stunning take on the Hazel Dickens song ‘Pretty Bird’. Without putting the album version too much in the shade, the live performance melted any aversion to a heart rendering emotive song. The pattern for the evening soon emerged and the full quota of informative chat was reserved for the first set. This ensured everybody present was well versed in the making of GALAX, the background to its fruition and the effects that emanated from a project that literally captured the very fundamentals of roots music. Just to back up a prior view on the tracks selected to feature on this record, ‘Jackknife’ came across exceptionally well and enjoyed a vociferous reception from the assembled music lovers. It may have lacked the critical fiddle parts, but it wasn’t too difficult to detect the communal love radiating from ‘Sally Ann’. As we approached the interval, Doug promised more rock ‘n’ roll courtesy of the Telecaster in the second half and concluded the contents of GALAX with the greater upbeat vibes of ‘Will They Still Know Me’; a co-write with another Kitchen Garden favourite: Ben Glover. At this point, it is timely to acknowledge the evening’s supporting cast. Joining Doug and Telisha for this UK tour is Austin based musician Katie Marie, who majored mainly on mandolin for the first half before reverting to drums for the numbers which benefitted from a more pulsating beat. She has been part of the Wild Ponies US tour and made a telling impact on this show as well. In replicating their role for the Wild Ponies January gig at the nearby Thimblemill Library, The Lost Notes opened the evening and played a spritely set of well-crafted tunes, liberally sprinkled across the acoustic spectrum and containing some sublime harmonies. Appearing in the usual stripped down trio format for these type of shows, the band are gearing up for a debut album release, and showcasing fine songs like ‘Bobby’ and ‘I’ll Wait Until the Sunrise’ will do the promotion no harm. 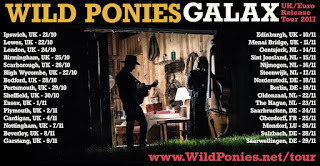 How were the Wild Ponies going to follow the songs from GALAX in the second half? There was obviously a big clue in Doug’s prior preview, but he kept to his word and yes, rock ‘n’ roll was the answer. Starting with ‘Born with a Broken Heart’ and climaxing with ‘Unplug the Machine’, the tempo was seamless, with on this occasion the chat being kept to a minimum; Not that they don’t have an interesting story about most of their songs. All the ‘greatest hits’ were featured including ‘Love is Not a Sin’, ‘Trigger’, ‘Things That Used to Shine’ and ‘Broken’. Inevitably, the temptation to tread the well-worn ground of ditching the mics to test the acoustic surroundings was adhered to and a beautiful version of ‘Radiant’ ensured the evening closed on a moment as high as what we were greeted to a couple of hours earlier. Hooking into the Wild Ponies style, ideals, ethos and music is a compulsive act for anybody with a remote interest in contemporary roots music. This is country, folk, rock ‘n’ roll or anything you want it to be, as long as you respect tradition, integrity and the power of song. This show signposted the right way and every new Wild Ponies convert furthers the cause of ensuring the UK remains firmly on the horizon of a band dedicated to sharing their music anywhere in the world.